I wanted to draw Todd doing something more interesting than standing and watching Selkie, so... juggling sparklers! 😀 I have decided this is canon. Todd can juggle. I’m oddly not surprised. He seems like the kind of person who’d be able to juggle. On the other hand, Selkie seems to be displaying human-plus coordination, writing a different thing with each hand. Double-posting to add that I’m glad Selkie has gotten her properly-fitting shoes. 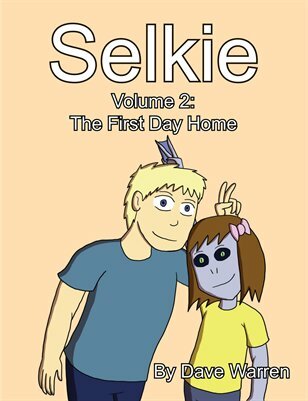 Selkie definitely has some talent! Come to that – so does Todd! I’ve tried juggling (just with bean-bag things) … not easy at all! Nice job on the sketches! …would it be insensitive of me to say that they would be cute as circus performers? I’m not trying to draw negative connotations, just pointing out their most amazing of skills, ’tis all. It took me a while to realize those were 4th of July sparklers. I thought this was a reference to the comic where Selkie said “I saws a movie once wheres a kids gots adopteds by wizards”. I thought it was another alternate selkieverse lol. 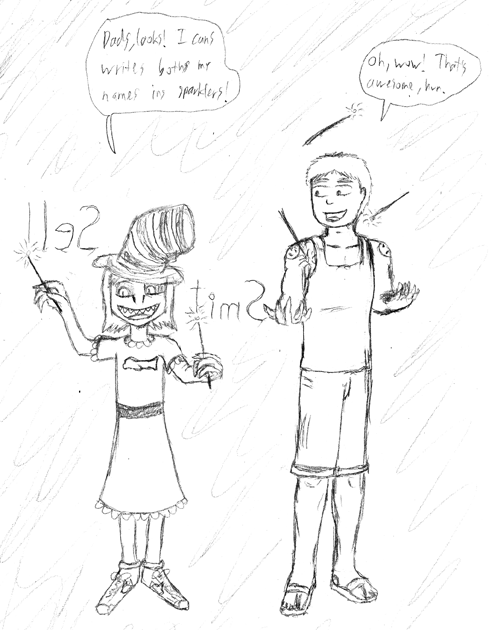 Wizard Todd & Apprentice Selkie. “I can write my name in sparkles”. Link to comic in question.